How to Navigate the Middle Ground during the Holidays! | Eat, Train, Thrive! The Holidays are not the time to be trying to be in fat loss mode. The All or Nothing mindset is not a healthy approach to maintaining your physique during the holidays either. Neither extreme is a good idea. It doesn’t have to be black or white! There is a middle ground. I’ve been there before. Holidays come around, and I would let my hair down. Eat to my heart’s content and plan to get back on the wagon like everyone else on January 1st. I know I’m not the only one. Boy, was I stuffed, bloated, and felt so yucky – this is because I was so extreme with my diet in general so I binged. When I was off, I was off! All or nothing begets dieting. All or nothing (also known as black or white thinking) basically means you either do it all, or you do nothing. In the case of the food – there is no moderation or balance – no middle ground. In current language, you either eat clean, or you don’t. Eat all the food in excess or eat like a bird, then eventually of course binge. You are either good or your bad! We’ve done this for several seasons because we think that all will be well. Am I Right?! We can jump right back on the diet once the holidays are over is where are mindset usually is. That never really works, does it? We look up, and it’s March, and we still haven’t lost the weight, so we spend the whole year dieting – dropping a few pounds here and there. Before we know, it’s the holidays again, and the cycle continues. It’s so exhausting physically and emotionally. It’s indeed is a battle that can’t be won until we give up the all or nothing approach and embrace the grey area. The all or nothing approach leaves no room to enjoy life or food. I would carry my Tupperware’s filled with “clean foods” to events or a take a food scale. Nothing inherently wrong with tracking your food for a time and of course prepping food for the convenience factor, but there is a time and a place for that. A food scale at Christmas dinner is not one of them. The issue is not being able to mentally let go of hang-ups about food. How many calories, will this make me fat, is this clean – just to name of few. Also, the fear of weight gain plaguing our minds is a nuisance in itself. I have totally missed some enjoyment during the holidays because of this mindset. Ask yourself this – is it really the end of the world if I actually gain a few pounds? Fyi- it’s not usually actual pounds of fat unless you go HAM (hard as a mutherfucker – eat with abandon) during any given holiday. It’s water gain – water retention from the increase in starchy foods and sodium. So, you see, we are worrying about nothing. The stress and the worry will create weight gain as well. It’s not every day that we eat apple pie, smothered pork chops, ribs, or a stuffed turkey. 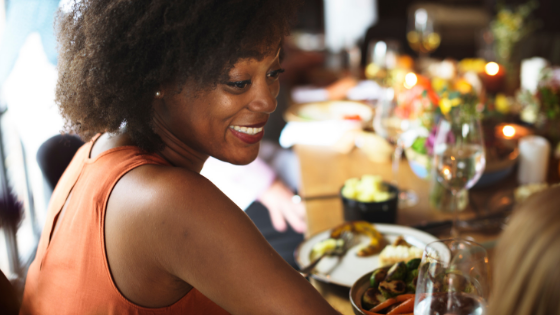 Any weight gain will normalize as you return to your usual way of eating. It really is that simple, but we complicate it. The grey area is exactly how we should approach the holidays, whether it’s Christmas, Thanksgiving, or Memorial Day. It’s exhausting trying to diet through the holidays or running to the gym to try and work the food off. Exercise should never be used as punishment. We move our bodies because we love our bodies. It’s a privilege to move, some of us can’t, so don’t take it for granted. During the holidays, you can still train and eat mindfully. It’s always your choice of course, whether you workout or eat mindfully or not. Whatever decision you choose, honor it with grace and not guilt. I can show you exactly how to navigate the holidays and keep your fitness and nutrition game strong. You don’t have to hit pause during the holidays, nor reset with extreme tactics on January 1st. I have a great resource just for that! 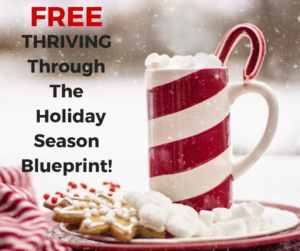 I have an amazing resource that will help you navigate the Holidays with a Flexible, Simple, and Sane Approach so that you don’t arrive at January 1st jumping on another damn diet or some damn cleanse! Navigate the Holidays in a Sane, Simple, and Sustainable way!